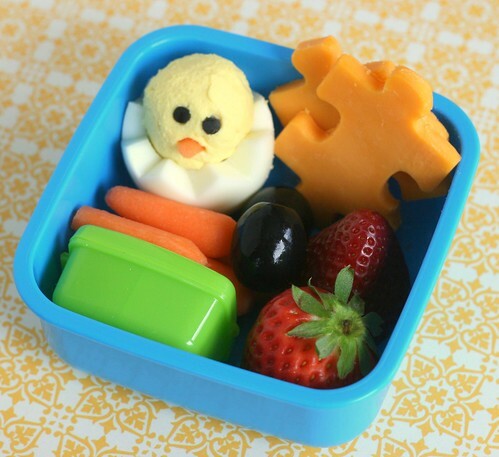 another lunch: something to chirp about - it's World Autism Awareness Day! something to chirp about - it's World Autism Awareness Day! Today's bento is packed in a blue box, being that blue is the official color of Autism Speak's "Light It Up Blue" campaign. In the back left corner is an egg chick (chirp! chirp! ), next to puzzle pieces of cheddar cheese. Strawberries, carrots, olives and a little dip container round out the snack. The puzzle pieces were made using one of the puzzle sandwich cutters from this Lunch Punch set. The egg chick is made from a hard boiled egg that I cut in half with a jagged border (much easier than it looks and easier than I thought it would be! ), then I used the yolk (with others too) to make a deviled egg mixture. Then I scooped the deviled egg mixture and shaped it a little to make a round shape and added it back into the egg white "shell". I used little pieces of black olive for his eyes and a carrot for a beak. Chirp! My "recipe" for the deviled yolk mixture is to mix with a little fat-free mayo (I HATE mayonnaise with a passion, the ONLY time I eat it is in deviled eggs or egg salad and I use the fat free because it gives the moisture needed without the taste of mayo!) and mustard, salt and pepper. Sometimes I'll also use paprika on deviled eggs. thank you for stopping by to tell me about the yogurt covered raisins. Whole foods...we don't have one of those but I'll have to look around for them they sound wonderful!! What a wonderful lunch, Melissa!! I love how your chick turned out, but I'm sad that you don't like mayo. I love the stuff! By the way, I'm wearing blue today! I know I've said it over and over and over, but I'm still fascinated by the bentos. I'm not quite motivated enough to make my own, but I am inspired. Keep it coming! I love the puzzle pieces! This is near and dear to me too. My brother is autistic and my son was, and is still considered mild PDD, (there's a few issues leftover, severe picky eating is one of them, so that's why I'm a big fan of your lovely bento boxes). I have to say I did not know there was a World Autism Day. That is so cool. Have you ever tried homemade mayo?